The lock screen is one of the most important parts of a phone; it allows us to see multiple information sets without unlocking our phone. Most importantly, we can see items in our notification bar and the time; other features include being able to mute/unmute the phone without going into the settings menu. At it’s core, this is all very basic functionality. Clearly, Google believes that the functionality we have is enough, and an average user should be able to get by. However, what if we want… more? It’s the nature of Android to have a degree of customization over other phones, so why should the lock screen be any different? 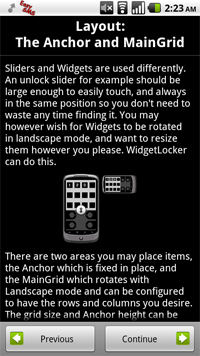 Enter WidgetLocker. 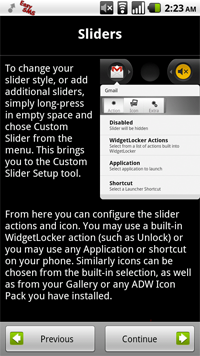 In a sentence, WidgetLocker replaces your lock screen with its own version – one that you can customize. With this customization comes increased functionality; users can add new sliders which accomplish pretty much any task the user can think up, like opening your SMS inbox or opening another app. To someone who likes being able to perform certain actions at a moment’s notice, this is invaluable. The app recently upgraded to version 2.0, which brings a number of improvements. 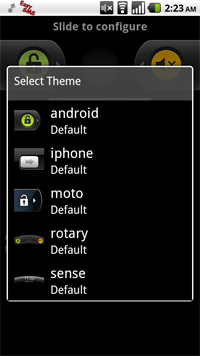 Most notably is the performance fixes and the inclusion of themes, the latter of which makes customization even deeper. One hesitation I had about the old version was its insistence on using the horizontal slider graphics; in this new version, you can skin your unlock bar in horizontal, rotary, Motorola or even iPhone styles. With the new sliders come new icons, and with those new icons come custom notifications through ADWNotifier. However, since I run GO Launcher EX, I didn’t get a chance to test functionality. Those using HandCentSMS and ChompSMS have options for pop-ups to appear over the lock screen. This is all a matter of artistic preference, but I’m guessing a lot of people reading this review are more concerned about how it runs. This has always been a bit of a moot point with my reviews, as I’m running a dated phone (overclocked Milestone) which doesn’t seem to like running certain apps too well. WidgetLocker is one of them: because that extra layer is always running, sometimes it slows my phone down to a chugging pace. Attempting to utilize the unlock screen before I did an audit of all my apps (and uninstalled a few) commonly led to a ten second gap between when I “unlocked” the phone and when I’d actually get to my home screen. This, sadly, is inexcusable. I’m guessing faster phones (and Gingerbread, since it’s been optimized for that distro) will handle WidgetLocker a lot better, but for those without access to cutting-edge hardware, this could be a problem. Unlocking the phone will play the default Android “unlock noise” about 5-7 times in quick succession. This is only fixed by going into the Android settings and turning it off completely. There’s no option to keep the default noise in WidgetLocker settings, so you’re stuck with their new sound. The grid is a little off from where my default slider position is; this is visually annoying after I’ve been used to something for over a year. Themes are downloaded by redirecting you to their blog via a browser. This is infuriating, as it makes the task of theming needlessly difficult. Beautiful Widgets does an amazing job of having a user gallery in-app; even GO Launcher runs a custom market search for you. But really, these are all nitpicky things. The real reason I won’t be keeping WidgetLocker on my phone is that I don’t use it; my lock screen looks exactly the same as the way I had it before the app. I figure there is nothing on my phone so pressing that I absolutely need to access it before I unlock. I’d rather my phone unlocks in a timely manner all of the time than add a layer that causes it to do otherwise. But maybe I just don’t have the creativity. 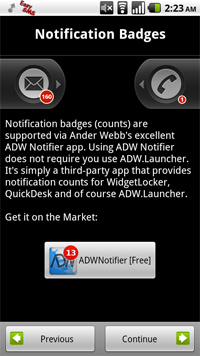 You can find WidgetLocker on the Marketplace for $1.99. Matt Demers is Droid Life’s app guy – you can find his work here three times a week. His Twitter is always open, and his e-mail won’t kick you out of the bar, either.